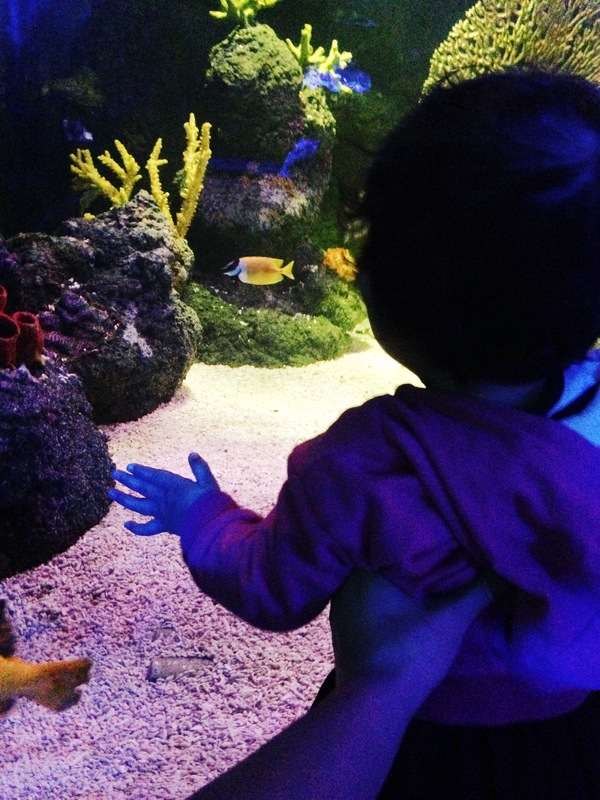 I’ve secretly been very excited about taking Emma to the aquarium – in fact when I met my other half’s son years back, I had wanted to go with him but was disappointed to find out that he had been dozens of times already. I knew how much Emma loves looking at water and hoped she would find it fascinating. To double up with my own excitement, we made an afternoon out of it with a few of the girls from my NCT group and their babies, to celebrate the birthdays of the ones who were born in April. It was such a great idea to do something all together; we picked the right day for it as it was raining by the bucketload when I left the house and hailing by the time we arrived. 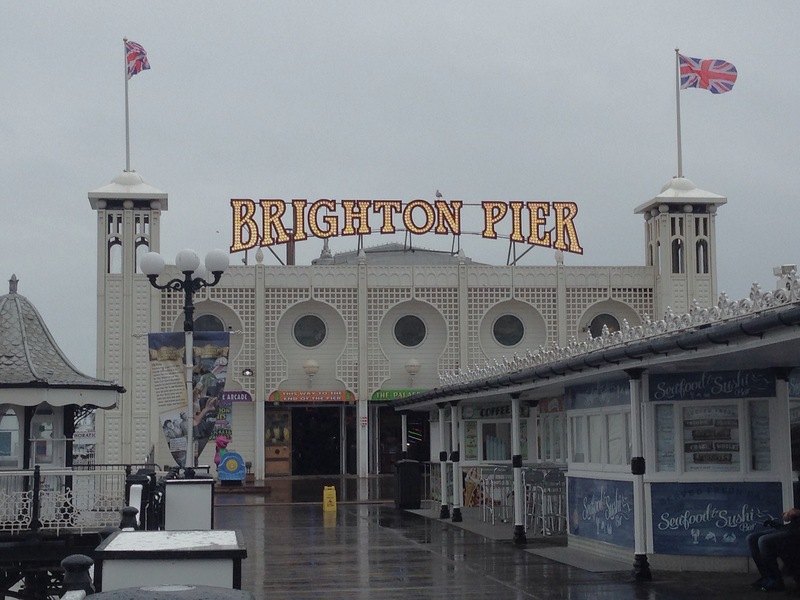 Sea Life Aquarium is opposite the Brighton Wheel on the seafront, so it couldn’t be a more central location. As we arrived I realised we were early – a pleasant surprise for me as I am usually rushing to get to where I should be, and invariably 10 minutes late throughout the day. We had about 20 minutes to spare so I decided to walk along the boardwalk on the pier with Emma, even though the rain was getting heavier by the second! 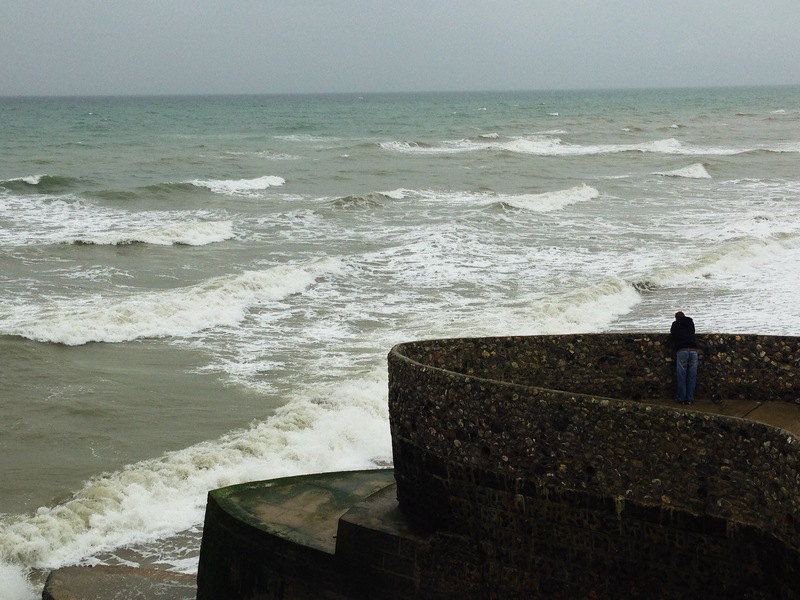 There’s something wonderful about seeing the waves crashing against the rocks and watching the rain – I always find the rain quite therapeutic. As we went to meet the other girls, I was glad one of them had given me a tip as to where the ramped access was. It’s not easy to find as it is on the other side of the road, below the Brighton Wheel but luckily I saw a few people going to same way so quickly followed. It was handy, as otherwise the entrance to the aquarium means negotiating 20-30 steep steps. It was quite busy when we arrived but we had pre-booked tickets so there wasn’t much waiting and I’d really recommend this as we got a £7.50 discount on each ticket. A couple of us had buggies and these could be parked before entering, and the rest had slings to carry the babies in. Although I’ve never got round to using a sling yet, it’s the less back breaking option for our pre-walking babies. Keeping them in the buggy might work, but the fishies are a little too high for them to see, so I carried Emma round the aquarium propping her up so she could see everything up close. As you enter, there is a big room filled with tanks of different fish, so we made our way round slowly so the babies could take it all in. 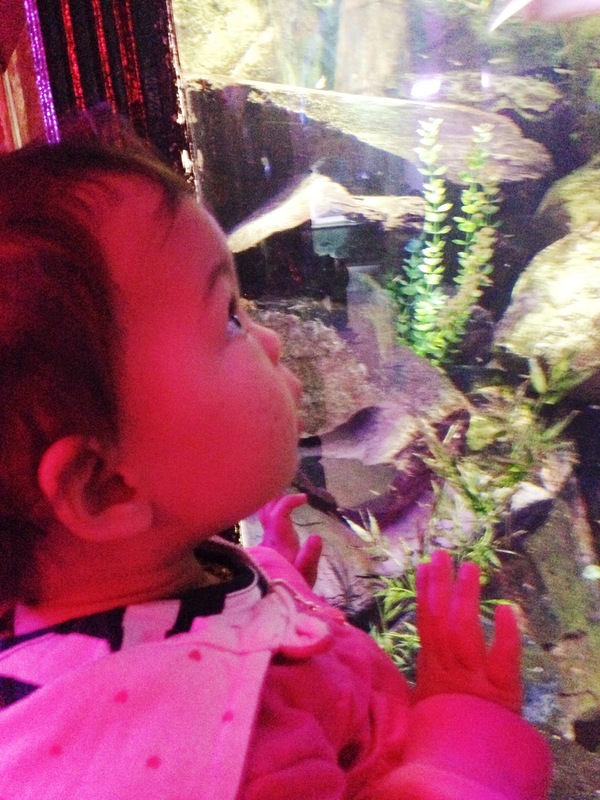 The lighting was dim and very atmospheric and the babies were immediately drawn to the splashing water and brightly coloured fish. 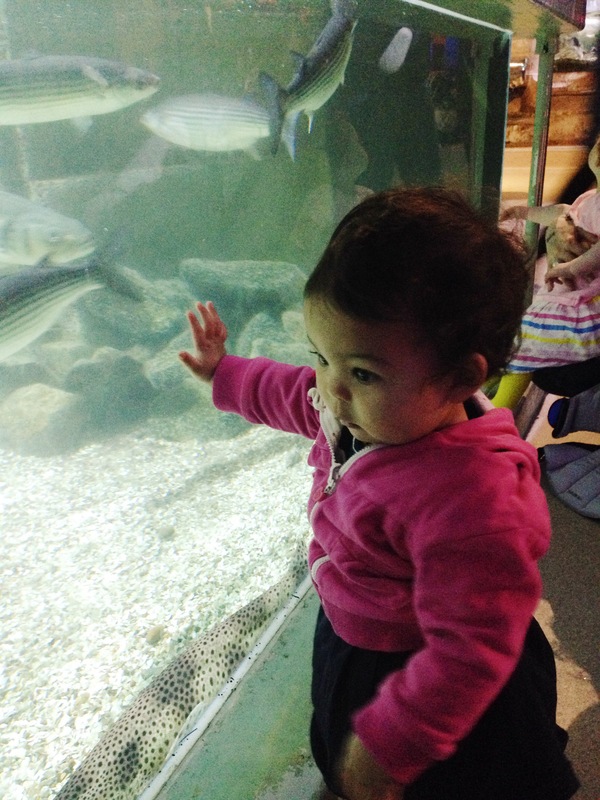 I’ve actually never seen Emma so transfixed, especially with the larger fish – she seemed to find it all pretty amazing. At the end of this room, we were led to another section with sharks in a tunnel, where you could see the water all around you. This was fantastic, and there were bigger raised platforms for them to stand on – Emma could have stood there gazing all day I’m sure! The walkway led to a couple lots more fish tanks with smaller fish and insects too. At this point, Emma and the others were getting a little tired – pre-walking is a funny stage because they don’t much like being held the whole time, but equally were too tired to stand assisted. So we decided to make our way to the cafe for a bite to eat and a rest, especially for the mummies! The cafe was in the centre of the main hall that we entered first and there was plenty of room for us all to sit and high-chairs for the babies too. We had organised a party bag for each of the little ones, with just a few pressies: a small Mr Men book, bubbles, a balloon and a sugar free muffin, which they all devoured straight away. Soon enough it was time to go, marked suddenly by Emma having a classic ‘I’m too tired now’ meltdown, so we headed back to get the bus home. By the time we left the gift shop, I took a quick look and Emma was fast asleep already. 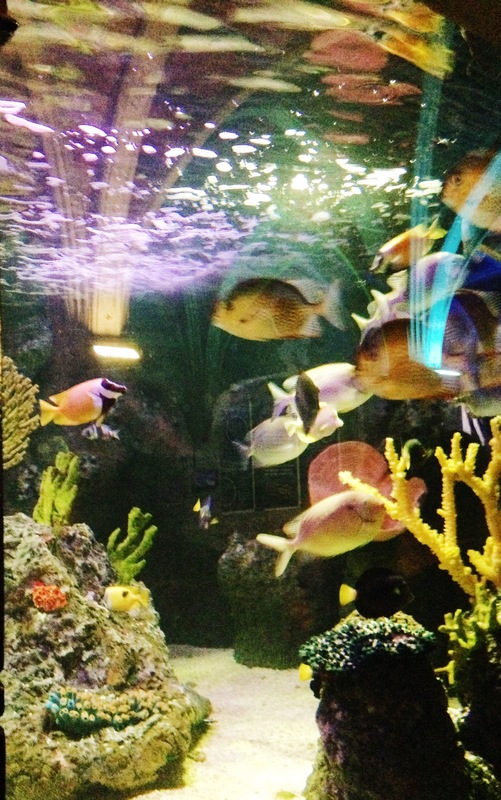 Sea Life Centre Brighton is open every day 10am-5pm with last admissions at 4pm. For more information, visit their website here. This is not a sponsored post.